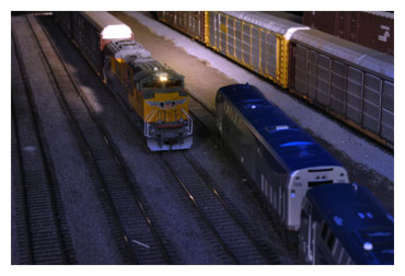 The GCOR (General Code of Operating Rules) includes Rule 17, which details how lights are displayed on locomotives. You can easily follow this rule using Tsunami decoders so your operating sessions are GCOR-compliant. Let’s look at the rules and how to implement them with Tsunami decoders. Rule 17 (GCOR, 5.9) states that you must display a bright light on the front of the train when occupying the mainline. The headlight should be dimmed and ditch lights (as well as other warning lights such as the Mars light and Gyralight) should be extinguished for opposing trains, when occupying the mainline for meets (other train takes siding), and during yard movement. To implement this with your Tsunami decoder, simply press F7 to dim the headlight. Press F5 and F6 to extinguish the ditch lights or other lighting effects. Headlights need to be fully extinguished if occupying a siding, clearing the mainline for a meet, or sitting still on a yard track. Simply press F0 to extinguish your locomotive’s headlights. Ditch lights and any other flashing warning lights must be extinguished in the yard, unless moving through a public grade crossing. Implementing this rule in your operating sessions is easy with Tsunami, and offers an extra element of fun and engagement with prototypical scenarios. Originally published April 30, 2015 in Issue 25 of the SoundBits Customer Newsletter for SoundTraxx and Blackstone Models. Be sure to visit the store to see the full line of SoundTraxx products today!